Open enrollment for the health insurance marketplace ends on February 15, 2015. As the deadline approaches, Cigna wants to remind American consumers about the importance of evaluating their options before choosing a health plan. It’s a decision you shouldn’t take lightly. Based on the results of an online survey conducted by Cigna, Americans are finding that the rising cost of health care is having a negative impact on their financial planning for the future. Cigna asked men and women ages 25-64 as well as Hispanics and adults over age 65 questions about how they view health care and affordability. The research, “Health and Financial Well-being: How Strong Is the Link?” sought the opinions of 1,847 insured women and men from across the nation who have health care coverage with many different carriers. The results of the survey showed that most people link good health to financial security and many are worried about the rising cost of health care. You can ease your anxiety by making sure you’re getting the most out of your health plan. Not all health plans are created equally. Check your benefits package closely and compare it to others as you shop around. Do you want wellness checkups? A 24-hour nurse helpline? Discounts on fitness and nutrition programs? Also consider financial protections, such as disability, critical illness and accidental injury coverage, offered by plans. Some plans also offer online tools that can save money and help you quit smoking, lose weight and manage stress. 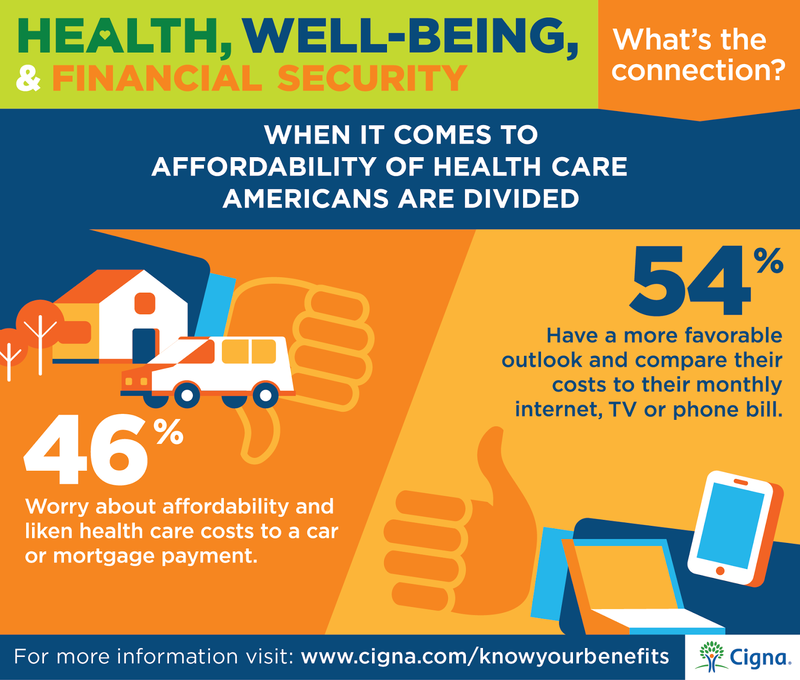 According to Cigna, if health care costs are worrying you, you don’t have to go it alone. Your health insurance company should be a valuable resource to help you lead a healthier, more secure life. Now is the time to evaluate your health care options before open enrollment ends on February 15. For more information about Cigna and the survey, please visit their online resources. This is a sponsored post brought to you by Cigna. The opinions expressed herein are those of the author and are not indicative of the opinions or positions of Cigna. Compensation has been provided for this post.